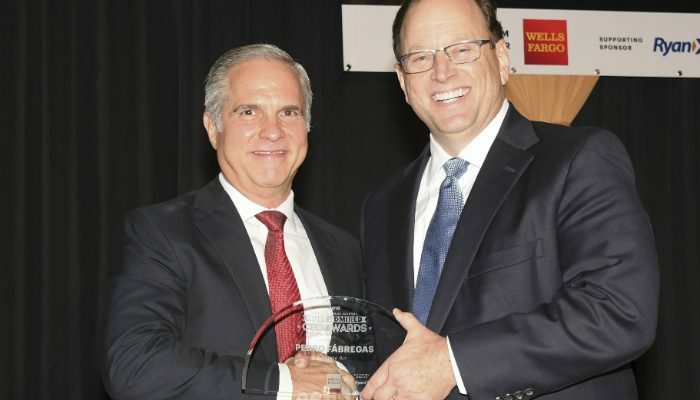 The Dallas Business Journal recently named Envoy President & CEO Pedro Fábregas as one of North Texas’ Most Admired CEOs. The publication recently held an award ceremony where they recognized Pedro and 29 other North Texas leaders. This is the first time the Dallas Business Journal has presented these awards. All honorees were selected based on a peer-to-peer voting process in which CEOs in the North Texas area ranked colleagues in their industry category. But that’s not all – during the event, Pedro also received a Reader’s Choice award after the results of a poll on the Dallas Business Journal’s website. Last year, Envoy set a goal of growing the operation – both the American Eagle regional flying the company performs on behalf of American Airlines and the ground handling work done at more than 100 airports throughout the U.S., Canada, Mexico and the Caribbean. During the past year, the company has increased the number of flights it operates to nearly 1,000 per day, it has added new destinations to the map, the fleet is growing – and there is an additional fleet commitment for 25 new large regional jets to start arriving later this year, and continuing into 2019, everything under Pedro’s leadership.